Talk of transitions and succession planning is something we are all familiar with right now. The demographics within many law firms make these areas of focus critical for future success. While most of these conversations and plans have been focused on getting a more senior Partner to let go of a long-standing client relationship to keep it within the firm, similar challenges are occurring with respect to the transition of law firm leadership from the seniors - some of whom have held their positions for over a decade - to the next leader(s). "Whatever <Managing Partner's name> wants is fine with me." "<Name> doesn't need to worry about a thing." "I know that <name> will be fair to us." "Why are we even having this conversation?" "What if some of the Partners who I've had to counsel get on the Management Committee?" "What if we merge after I'm out of leadership and the firm is run by people who don't even know me?" "What if the economics of the firm turn downward and the Partners then look at my compensation differently?" "Will those who are voted into the partnership after my transition starts care at all?" 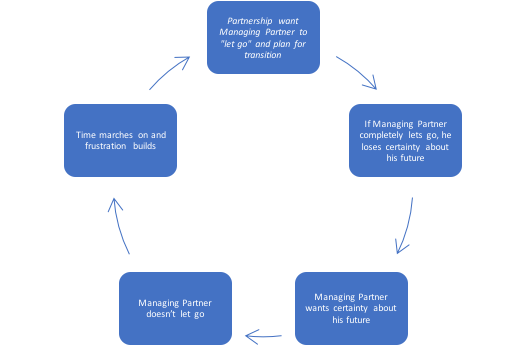 To break out of this loop, someone safe, neutral, and trusted (a Senior Partner or a trusted advisor) needs to intervene and give both parties some cover. The middle man can do this by declaring to everyone that - despite their mutual admiration and trust - the smart way to move forward and protect the interests of all parties is to create a detailed plan. A plan that clearly defines roles, responsibilities, expectations, title, and related compensation by year or phase. Hopefully your firm has a beloved, revered, and trusted leader. If so, please watch for the scenario described above. It's easy and vitally important to resolve if you recognize it. Otherwise, you may slip into an infinite loop of inactivity that can create major problems. The stakes with a leadership transition are much higher than those associated with any individual client relationship transition. Most firms can survive a lost client due to a botched transition. The uncertainty created by a botched leadership transition process can be much more damaging. "Fear comes from uncertainty. When we are absolutely certain, whether of our worth or worthlessness, we are almost impervious to fear" (William Congreve). Within a law firm, fear results in departures. If, per the quote, fear comes from uncertainty then the solution in this scenario is to provide certainty via a very detailed plan. With this in hand, your Managing Partner can let go. Michael Short is a founding Principal of LawVision Group. He counsels law firms around the world on strategic, management, financial, and operational issues. His client base ranges from small, “local” firms in many countries to large, multi-national operations.